For most franchises, managing to top the box office twice is tough enough—by the time a series gets into its third or fourth chapters, the law of diminishing returns tends to be all but unavoidable. 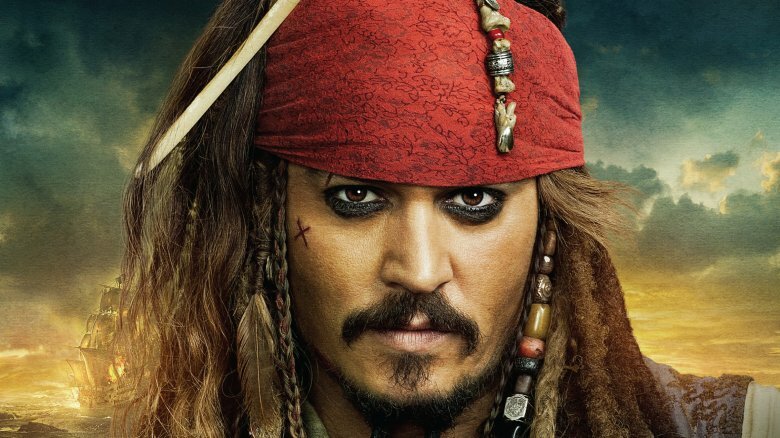 Most franchises don't have Johnny Depp as Captain Jack Sparrow, however, and with him at the helm, Disney's got a blockbuster-sized exception to the rule. For proof, look no further than the fifth installment of the Pirates of the Caribbean series, which is just as ridiculously fun as any of the prior four chapters—and it's just as chock full of Easter eggs, too. We've set sail on sequel tides and ventured below decks to plunder this movie's vast stores of sneaky loot, and now we're back from the voyage to share it with you. Here are some subtle (and sometimes not-so-subtle) in-jokes from Pirates of the Caribbean: Dead Men Tell No Tales that all ye landlubbers will just love. 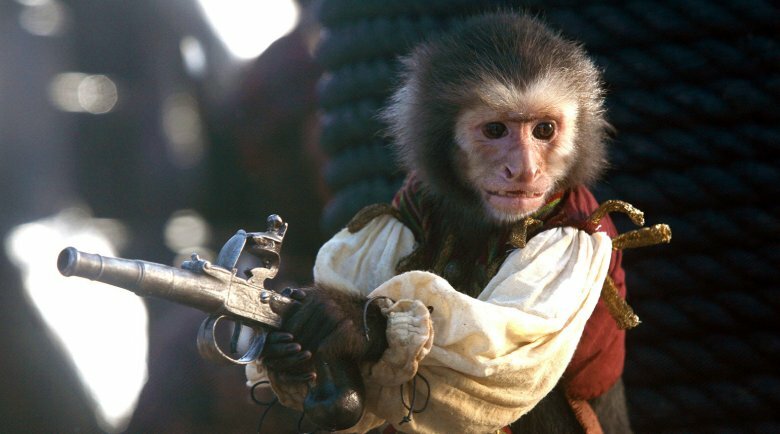 Aye, but beware the spoilers, mateys! We didn't need Javier Bardem's Captain Salazar to actually say the line "dead men tell no tales" before the opening credits to get where the phrase came from. It was previously spoken in the original theme park ride and heard in the original movie (courtesy of a parrot) as well as the third film, At World's End, uttered during a voiceover moment in a transition scene. Meanwhile, anyone who's been hungering for some old school Johnny Depp swagger should be pleased with this film's extended glimpse of the swashbuckler in his younger days. Thanks to Captain Salazar, we learn exactly where, when, and how the Captain got his name: he defeated Salazar's squad by having them steer into the Devil's Triangle to be obliterated, and looked like a sparrow upon first taking command of his ship and the compass. We also learn where he got all his odd accessories. 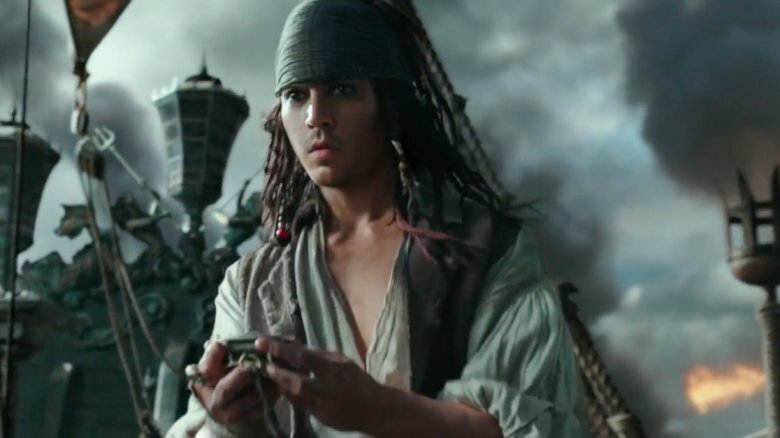 After killing Salazar, who'd been on a mission to destroy every pirate ship in the sea, Sparrow's new crew offered him his signature beads and hat, among other items of booty, as a tribute for his conquest. And thus his famed fashion sense was born. 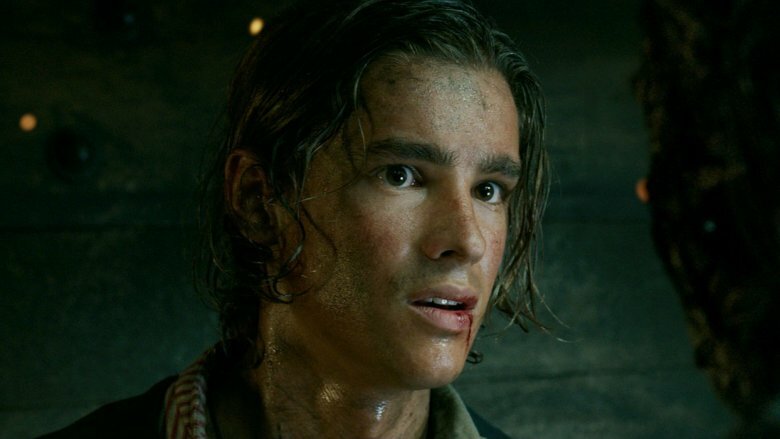 Henry Turner is the son of Will Turner, so he'd definitely heard (and believed) the tale of the Kraken his father escaped during the second Pirates movie, Dead Man's Chest. So when scientist-slash-skeptic Carina Smyth makes an offhanded comment about his probable belief in mermaids and the Kraken, he says, "the Kraken doesn't speak." And he'd know. Interestingly enough, as it was described to Will in a past life, the Kraken has "the reeking odor of a thousand rotting corpses." The attack mode of Captain Salazar's ship is quite reminiscent of the way the Kraken would down a vessel—and guess what? It definitely smelled like rotting corpses, because it was staffed by desiccated sailors. Thanks to a production insider's Reddit post, one Easter egg was laid out long before the movie's debut. As a nod to Japanese pirate manga series One Piece, Captain Hector Barbossa's monkey, Jack, is complimented for his red-coated wardrobe—said to bear a striking resemblance to the manga series' main character, Monkey D Luffy. As for why this Easter egg was dropped, well, it may be nothing more than a nod to his name and the fact that he's a happy pirate, much like little Jack here. It's no secret that Johnny Depp has a thing for working with rock stars—heck, he is one himself, with the Hollywood Vampires. 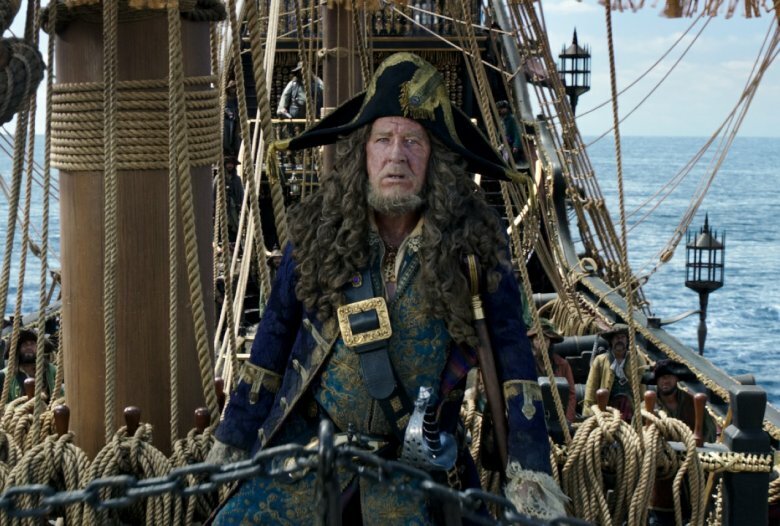 After borrowing some of Keith Richards' style to inform Jack Sparrow's appearance, he helped the Rolling Stones guitarist snag a role in At World's End and On Stranger Tides as his father, Captain Teague. For the fifth film, Depp turned to one of Richards' peers: Paul McCartney. Depp told USA Today that the filmmakers needed a "pirate rocker" to sub in as his Uncle Jack, and Depp thought of the Beatles legend first thing, inviting him to appear via text. Sparrow's Uncle Jack offers him a joke as he's about to be executed for his crimes against the island: "A skeleton walks into a bar, orders a mop and a beer." Simple enough, right? 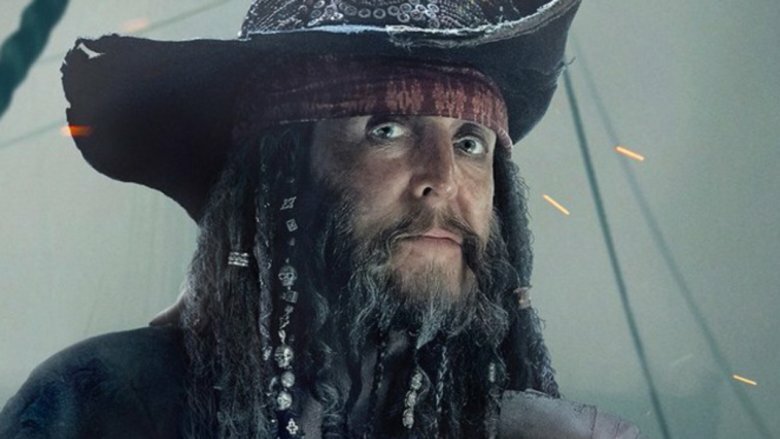 Well, Depp might not have gotten a writing credit for Dead Men Tell No Tales, but he certainly deserved one, because he's had a long history with that quip. While he was filming Donnie Brasco, Depp's co-star Al Pacino would reportedly tell him the joke repeatedly, and he never quite understood it. He told The Express in 2010, "He thought it was my problem. He inflicted it upon me and I could feel my IQ points drop. I finally figured it out." Obviously, he's come to appreciate the humor. An (un)intentional Lord of the Rings reference? Given the fact that Orlando Bloom starred in the Lord of the Rings franchise as well as the Pirates movies, fans have cooked up a number of theoretical links between the two sagas over the years—and Dead Men Tell No Tales offers another bit of crossover potential. Kaya Scodelario's character, Carina Smyth, steps in at one key point to decipher the "map which no man can read" because, as she points out, "I am no man." Rings fans may remember the moment in Return of the King when Eowyn, also defiantly staking her spot in a boy's battle club, defeats the Witch King of Angmar…whom no man could kill. Aside from misguidedly selling a lot of spinach, 1930s cartoon character Popeye boasts a theme song that's evidently become a pirate's jam of choice on the high seas. 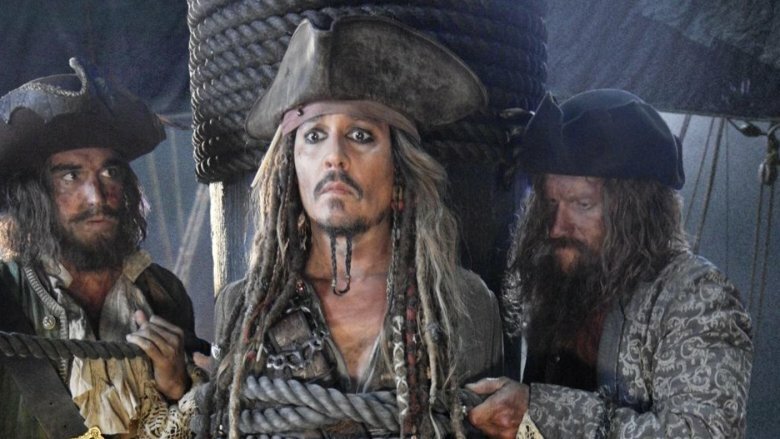 Before hearing of Salazar's escape from the Triangle of Death, Hector Barbossa enjoyed the splendor of his successes by listening to his in-house musicians—and one of the songs in their setlist certainly sounds like an instrumental sampling of "I'm Popeye the Sailor Man." When Captain Jack is en route to his execution he's given the choice between hanging or dying by the newfangled guillotine device recently invented by the French. 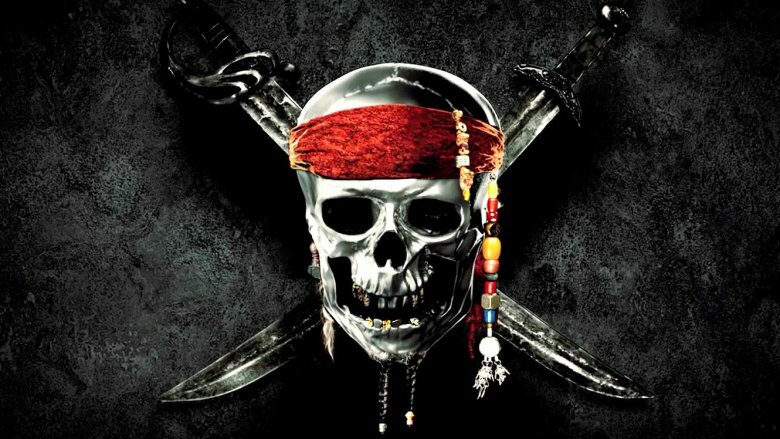 While most of the Pirates films have only loosely associated themselves with historical events and definitely fudged the timeline a bit at times, the former films had been pegged as taking place somewhere between the 1720s and 1750s. This reference seems like a pointed effort to pin down a more precise date of events. The guillotine wasn't invented until 1789 and was first used in 1792, around the French Revolution. Jack also mentions that the French invented mayonnaise—which they were long believed to do in 1756, as part of a victory feast for the Duke de Richelieu after he beat back the British at Port Mahon that year. Captain Jack might not be known for his historical humor—and some historians believe it was actually the Spanish who came up with the condiment—but the fact that he mentions mayo to a man of the British crown certainly seems like a sly dig. 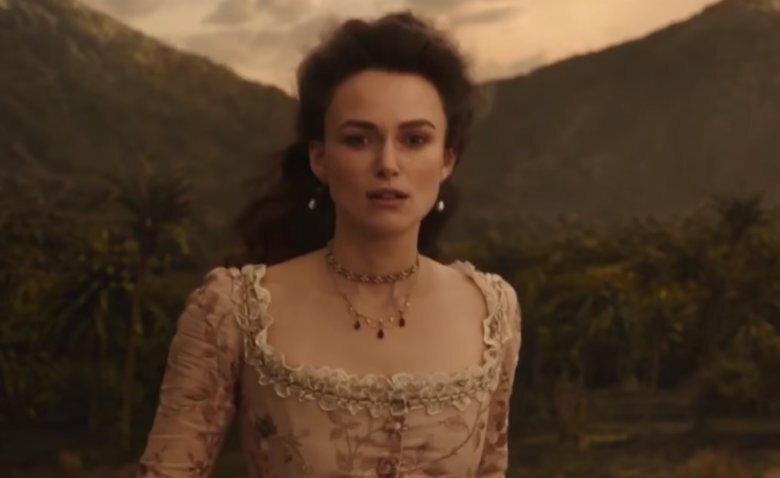 Keira Knightley confirmed she wouldn't be returning to reprise her role as Elizabeth Swann in any future Pirates movies in 2014—something she'd said before to justify her absence from film four, On Stranger Tides. So when Brendon Thwaites' character Henry reveals he's the son of Will Turner and Elizabeth Swann, it seems safe to assume that Captain Jack's quip, "Does Mommy ever talk about me?," will be the extent of her "appearance" in Dead Men Tell No Tales. In the film's epilogue, though, we see Elizabeth reunited with her husband on land—a significant sight because the two had previously come together during At World's End, although he was cursed by Davy Jones to only be able to walk the earth once a decade. Once Henry and friends successfully wielded the Trident, his father was finally freed, making for a happy reunion on the coast.